Cherokee’s Tori Hampton, right, 7, runs with the ball against Eastern defenders, Savannah Slack, 33, and Madison Cowdin , 9, during the first half of the lacrosse game at Cherokee High School, in Marlton, N.J. Monday, April 30, 2018. 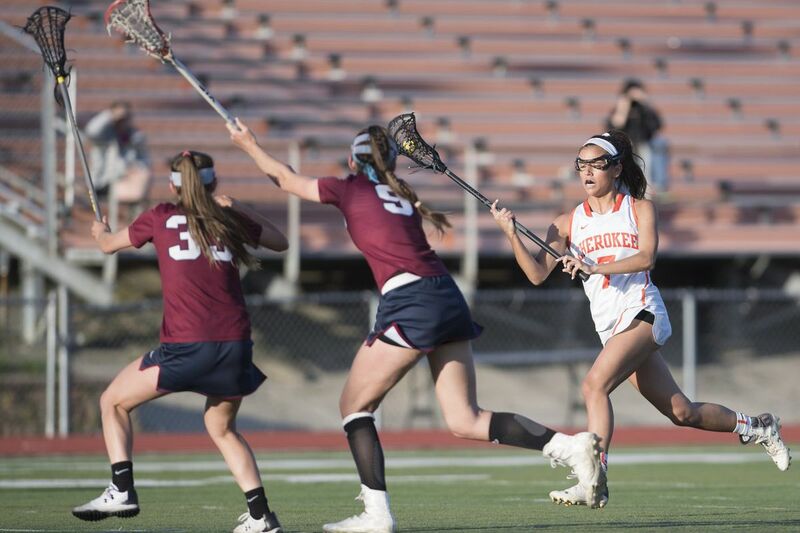 Victoria Hampton scored seven goals Thursday to lead the Cherokee girls' lacrosse team to a 18-9 win against Washington Township in the South Group 4 quarterfinals. Gab Bodine chipped in six goals and Alex Kulinski notched a pair of goals in the win. Brynn Eilbacher netted her 100th goal in Camden Catholic's 18-4 win against Sterling in South Group 2 quarterfinal play. Eilbacher finished the match with four goals. Saige Gidzinski and Kate Walsh also found the back of the net four times. Kara Heck scored four goals, including her 100th goal as top-seeded Eastern rolled past Kingsway, 17-4, in the South Group 4 quarterfinals. Dani Mlkvy, Marissa Robbins and Savannah Slack each posted a hat trick in the win. Reilly Shaup made her 200th career save and Alyssa DeAngelo scored her 100th goal as Clearview toppled Williamstown, 19-7. Rachael Cardone and Veronika O'Donnell paced Bishop Eustace with four goals each as the Crusaders rolled past Our Lady of Mercy, 17-2, in the South Group 1 quarterfinals. Molly Monaghan had a hat trick while Julia Gatelein and Mia Rose Voss also had multi-goal games. Kira Sides tallied eight goals to lead Middle Township to a 21-10 win against Lower Cape May in South Group 2 quarterfinal play. Maddie Barber finished with four goals in the win. Erica Barr paced Shawnee with five goals in the Renegades' 11-2 victory against rival Lenape in quarterfinal play of South Group 4. Jamie Carvin struck twice for Shawnee in the win. Anna Wright's four-goal performances led West Deptford to a 16-2 win again Barnegat in the South Group 2 quarterfinals. Antonia Gismondi and Caroline Perry each posted a hat trick for the Eagles.